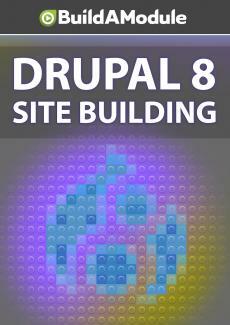 Solutions for chapter 12 of "Drupal 8 Site Building"
You know you're right. So why watch the video? And here are the answers to the quiz. Question one, which modules will allow you to keep form submissions in the database? Check all that apply. And the answer is A, Contact storage, and D, Maillog, they both store messages for different reasons, Maillog stores the messages because it stores any emails that go out, whereas Contact storage is more geared toward our saving the submission for the purpose of reviewing it later, but they both do it. Question two, you can add a menu as a block by default, true or false? The answer is true, a nice feature to have. Question three, contact forms are entities, true or false? The answer is true, even though they're a little different than other entities we've talked about, they're still fieldable. Question four, what can you do to change the location of a menu block? Check all that apply. And the answer is A, C, and D. So you can change a block's region in its edit form, you can drag it around in the block layout page, and you can get to the edit form by using a quick edit link, but the one thing you can't do is click on a quick edit link and then drag the block. You'd have to go through another step here to get to the block layout page. And question five, which features does the contact module include by default? And the answer is B and C. You can preview submissions and you can set who the recipients are, but you have to install the contact storage module in order to set the URL to redirect to, or to change the text of the submit button. Okay let's check out the solutions to our challenges. Challenge one, move the unmasquerade menu item to footer menu. So, on the homepage, we can see the unmasquerade menu item here. Let's click Edit, and edit the menu. So here's our unmasquerade item, let's click Edit. Here we can set the parent link, and if we click this, we can see all the menus and all of their submenu items, too. So we want this in the footer, so I'm going to scroll down to footer, and let's click Save. Now let's go back to the homepage and take a look. If we scroll down, unmasquerade is now down here. Okay, challenge completed, let's roll this back. I'm going to click Edit, and Edit menu, let's go to the operations under unmasquerade, and let's change the parent link, we'll scroll all the way up here to user account menu, and Save. We'll go back to the homepage and we have it back. Challenge two is add a checkbox field to the personal contact form for No need to respond to this request. So like a user is submitting a form, and they don't need a response, they just wanted to send something out there. Okay, so let's go to Structure, Contact Forms, Contact MagnifAscent, and Manage displays. And we'll add a new field here, the field type, this is going to be an on or off value, so we'll select Boolean.